Treasure Box: It was more a personal tradition. A gift comes from an overflowing cup. My cup is empty. When you give up something that you need, it is a sacrifice. So, it wasn't a gift. It was a sacrifice. But it was not a sacrifice for the event or for the principles of the event or for anyone at all. It was a sacrifice to That Which Is. It was my rite of worship. When Kell contacted me this year about burning the Temple again, I was already swamped. I told her it would take at least a week out of my schedule. It took three solid weeks. In those three weeks, I wrestled with design decisions, cussed at bugs, berated myself for making a commitment I could not afford, and cried in anguish for falling short of my own expectations. When I scripted the burn for the first time in 2007, it took me four or five very long days to script and to test. The day before the event was to start, we were left without Man or Temple, so I was scripting as the event was going on. And I had to burn both The Man and the Temple. It's not that simple anymore. In the quest for a more realistic burn, I've tried to innovate and create some new technique or new way to do some part of it. I raised the bar for myself every year. In 2008, Damanios added glass to the Temple design, so I experimented with breaking glass. The broken shards were particles. It was the year my grandmother passed away and I was triggering the burn from a little Internet cafe in a small rural town in the Philippines. The trigger wasn't coordinated by script. Poid Mahovlich had to help me trigger each piece. 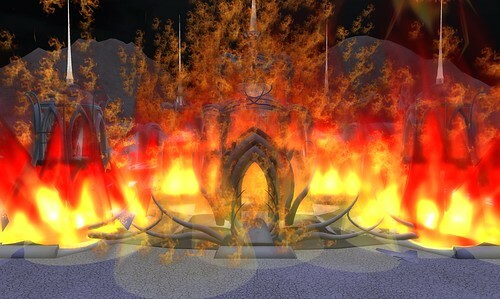 In 2009, I coordinated the trigger by "cocking" the scripts to listen for a code, switched to prim glass shards, added sparklers for the "bones" inside the temple at the start of the burn, and introduced the megaprim fire, which was a disobedience of the explicit rule that megaprims not be used in the event that year. But there was no way I could achieve the same effect with 10x10x10 prims. The flexy prim was a simple and elegant way of simulating the movement of fire. And with glow and transparency, the dark silhouettes of the objects inside created a dramatic effect. I overheard someone in the audience say that it was the best use of megaprims he had seen yet. Somehow, that comment justified my transgression. But the burn had now become much more complex. It was also the year I became disillusioned about the whole event. I was reprimanded because I blogged about my disagreement with their plans to desecrate the Temple and turn it into another party venue. That reprimand made me feel like a hired hand who should shut up and just do as we were told. Except we weren't really "hired" because we weren't paid. Neither did we volunteer on our own; we were asked to do it. I could have left; instead, I chose to stay because I had made a commitment. But the work became emotionally painful. After the burn, Damanios said, "I was worried your heart wasn't in it, but you proved me wrong." It wasn't that my heart wasn't in it. It was that my heart was broken. I didn't think I could handle another burn. When Kell asked me this year, I was torn. I really couldn't afford to do it, but it felt as though a long-lost lover was asking to be taken back. Damanios already agreed, and I had told Poid in the past that I'd burn any Temple Dama builds, so I chose to say yes. This year's coordinators are much nicer; the issue this year was time and personal resources. I had to give up a timeshare week that I had scheduled months ago. I had to postpone projects that I am already behind on. And because it was on such short notice, I didn't have time to think about the design or to experiment. There had been significant improvements in the Linden Scripting Language to make scripts more efficient, so I knew that I had to rewrite all the scripts at the very least. But there had to be something innovative somehow. So this year, the censer played an important role in the burn itself. I started with the idea of paper boats and I changed my mind. It was serene, but standing water doesn't make sense in a desert. I was playing with llTargetOmega on child prims when the objects in their orbits reminded me of planets, and that, in turn, reminded me of an old collectible Christmas ornament that I created for the International Spaceflight Museum in 2007. Touching the ornament would change the sphere into the sun or moon or any of the planets. And that's where the Lotus Suns idea came from, except I used the texture map of Venus instead. Messages in the Lotus Suns inside the Temple. When the burn was triggered, the messages were shouted out in public chat, which is the tradition. In the past, each pod burns by itself after the messages it holds are shouted out. This year, the lotus sun pods were pulled into the center sun which grew slightly with each pod crash. At the same time, the lava-like fluid in the censer bowl started rising at the center towards the sun. By the time the last pod crashed, the tip of the rising fluid had already reached the center sun. The rest of the fluid was then "slurped" into the sun, which grew even faster and finally burst, as flames shot out towards the four outer structures of the Temple. A few moments later, the outer structures burst into flames and the glass broke into pieces. And the fire started. In the past, I had always wished I could add a "story" about how the fire starts, instead of chalking it up to spontaneous combustion. This year, I finally did. I used megaprim fires again, and even though we could edit megaprims now, I decided to let the fire prims fade in, instead of growing in size. That was an aesthetic decision. This year, I also added fire licks, which took me a while to experiment with, and I'm still not entirely happy with it. Start of burn, soon after the whoosh. I had to cut some corners, so to speak, with the main burn, because I was short on time and because I was keeping the whole burn efficient. Even on the day of the burn, I was tweaking settings and rewriting code. Treasure Box: I wish I had more time. Treasure Box: Only if Dama is building. Treasure Box: That's practically a commitment! If Dama and I keep pointing at each other as the condition for agreeing to doing it again next year, we're in trouble. Thankfully, Dama won't commit because of his schedule. It isn't so easy for me. The burning of the Temple has acquired a spiritual significance. To be asked to do it feels like a higher calling. I cannot say no. Even if it requires me to make a sacrifice. Even if it consumes me. All I can do is require conditions to be met. Years ago, I approached Ana Forrest at the end of one of her yoga seminars in Seattle. I was considering being a yoga teacher on the side, but I didn't feel ready. I felt I had a long way to go in my own yoga practice before I could start training as a yoga teacher. I expressed my concern and her response struck me. She said, "Teach what you know." I am at that junction again. I'm at the start of a marketing venture, learning about network marketing myself, and knowing that I'll have to teach people about it. But what do I know? Two months into this venture and I've read many articles and blogs and a book about network marketing. So many advice floating around, all saying the same things, all selling their own "system". All of them differentiating themselves by saying they don't do it the traditional way. And they claim that, if you buy into their system, you'll distinguish yourself as an expert. How can you be distinguished from the other "experts" if you're buying into a turn-key marketing system? I'm working with a very good company. Several people have told me so, fellow network marketers who are in other companies themselves. Network marketing is less about about marketing the company and the products, and more about marketing yourself. Network marketing is a highly competitive market. However, I am sticking with this because I see the potential in network marketing overtaking traditional marketing, and I'll tell you why. We've seen the power of the web. We've seen how blogging and self-publishing online is now threatening the paper-based publications. I think network marketing has the potential to do the same in the marketing field. Certainly, network marketing has been around for centuries. But network marketing on the internet is a recent development and it's still a big jumble out there. I don't think people have really figured it out yet. If they have, it would be easy to teach and duplicate. However, that's a good thing. An industry in its infancy (in this case, again) holds great potential. So, we observe and we experiment and we learn. And we teach what we learn. 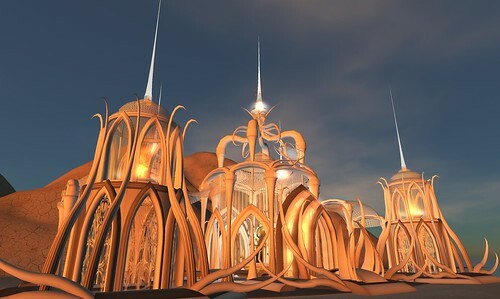 First, a brief background about my involvement with Burning Life. I joined in 2007 as part of the Interactive Architects team and ended up being the scripter for the burn of the Man and the Temple that year. In 2008, I was asked to burn the Temple again, which was all I got done due to a death in the family that took me outside the US. In March this year, Poid Mahovlich asked me again to join the Temple crew and she said she also got Damanios Thetan to join again. Dama built the previous temples and I am honored to burn anything Dama builds. And I'm sure I'm not the only Damanios Thetan groupie out there. Yesterday, Dusty Linden contacted me to invite me to today's kick-off meeting. She heard from Dama that we had both agreed to work on the Temple. After the meeting today, I had a brief chat with Dama and he mentioned that he was expecting to receive "a notecard with stage demands" because the "temple is being used more as an events stage this year". My reaction was "Nooooooo". I had to talk to Dusty soon after that convo. I told her, "I thought that the reason the burning of the Man is separate from the burning of the Temple is that the burning of the Man is more of a party atmosphere and the burning of the Temple is very solemn." My point was that the Temple is hallowed ground. It is not the place for partying. 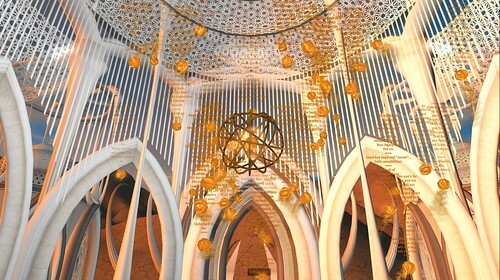 Dusty clarified that "the idea is not to design a temple that is a stage... it's to incorporate performance space into the plan... so that we can make it the focus of all the fire related activities". When I asked if all the fire-related activities were solemn, we got into a discussion about what "solemn" means. It seems that she associates solemnity with sadness, and I disagreed with that definition. She added that the Temple is a place to be spiritual and I agree with that. Her reasoning for doing fire events at the Temple is because "fire is an ancient ritual among us humans ;-) ... tends to evoke the spirit". I agree that fire is used in ancient rituals, however, fire is not always spiritual. As an example, I mentioned that fireworks on the 4th of July is not spiritual. In fact, the burning of the Man itself is not considered spiritual. She finally admitted that "Basically, we wanted Yman to be able to have a pole star for her fire performances... and the drummers always ebed up there drumming... and where the drummers ars are , the fire dancing begins" [sic]. I think her logic broke down there. I won't even ask why Yman is so special that her group gets to perform at the Temple, the most hallowed ground in all 34 sims. Or why the drummers couldn't be moved. My question is: Do we behave differently inside hallowed spaces if they're virtual? Even those of us who are not religious ourselves understand that temples and other places of worship are for religious rites and for quiet contemplation. When we go in, we behave a certain way, out of respect. If I were to enter a Buddhist temple, I would take my shoes off, out of respect. If I were to enter a Moslem mosque, I would cover my head with a veil, out of respect. If I were to enter a Catholic cathedral, I would briefly kneel on one knee before sitting quietly in a pew, out of respect. Even if I were an atheist, I would not go to those places and start fireworks and talk loudly and play loud music and have a party. No, I show respect for the people who go there to commune with their God. Why then are we showing disrespect in a Temple simply because it's virtual? This was a quieter day. Fewer people were around since there were fewer presentations today. I caught the second half of the Project Management presentation in the business track, and I'm thinking of working on a version control tool for objects. I also caught the second half of the Building a Community session in the fashion track, but I didn't learn much there and the talks tended to go off on a tangent. At noon, I rushed over to the Avatar Design session, which turned out to be presented by Kaz, whom I met yesterday. We got a good look at her new Dravyn Hatchling project. Her work is very impressive and she makes it sound easy to make. 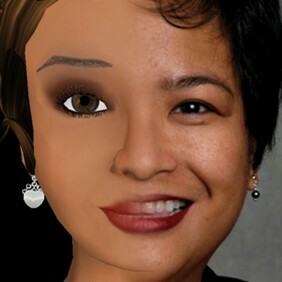 Artists of her caliber are the ones who are changing the face of Second Life by bringing professional game quality into SL. Then off I went to the Benefits of Virtual Worlds for the Physically Disabled, and I saw JanythKU Techsan by the door. Janyth did the presentaion on online learning in the education track last Friday, but as I was reading through the bios later, I realized she was also Saxet Uralia, whom I met at Burning Life 2007 and who is still in my friends list. So I went to say hi and she gave me a hug after she read my name tag. Inside the room, I found Ina Centaur again and Mia Kitchensink, who turned out to be a close friend of JamesLarken Supply, the presenter. I (as my main alt) know James only in passing, since he also used to go to Capos Calderwood's shows frequently. It was a very informative session from a disabled person's standpoint. I wanted to say hi to James at the end, but I had to rush off to catch the bus to the Exploratorium. I overheard the doorman give instructions to someone else for the #30 bus stop. As Patio said, it was only a couple of blocks away. As I was waiting, I saw Simon again. Simon is the man who went to the wrong hotel and attended our convention instead of the one he intended to go to. He was with LizaJune Stoop, who is building a historical virtual museum in SL; I offered to help. We arrived a bit late, but the group was still near the front, and more people arrived after us too. (We got in free, being guests of Patio.) I won't talk about the exhibits, but, hearing Patio talk about the concepts behind them, it sounded as though we were in Wonderland. It's like being a child again. Most of our group stayed behind with Patio after the bells rang to indicate that the museum was closing. And he continued to show us a few more things. In the end, he offered to reveal the secret to seeing polarized light (this was after discussing an exhibit that involved polarized light), but he warned that after you learn it, you can't unlearn it, so you would see a bowtie shape everytime you look at a monitor screen.